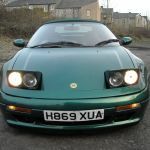 Elans for sale in the UK. Discussion of prices of Elans advertised for sale on LEC is prohibited in open forum, private discussion is perfectly acceptable. A separate area for discussion of prices of Elans not advertised on LEC and market value generally is available in the 'Elan Buying Help section' of the 'For Sale' area. It's been serviced, MOT'd and put back in the garage a lot recently. New alternator and battery fitted last year. Good all round condition. It's been resprayed racing green from its original colour at some point (before I bought it) and fitted with S2 alloys and a green roof. Roof seals in good condition. A post seals could do with replacing. It comes with Everest Mountain chip and full Piper 2.25" SS exhaust including PCE. Original exhaust also available. Interior is OK but the seats are a little tatty with the stitching split on the passenger seat. Mesh wind deflector fitted. Engine starts first time every time. Timing belt has been changed but due a new one. Last edited by AndyT on Mon 15.04.2019, 10:00, edited 4 times in total. I bought the car in May 2007. There are further bills in a folder for other previous work carried out. For what it’s worth, this looks like a good deal. I guess November just isn’t the time to sell convertibles. Now with a brand new pair of Jamie's A post seals ready to fit! Andy did you get my PM? mattdovey wrote: Andy did you get my PM?